Dr. Ali Sepehr recently upgraded his practice website to a responsive design, enhancing user experience and providing a convenient resource for patients on the go. 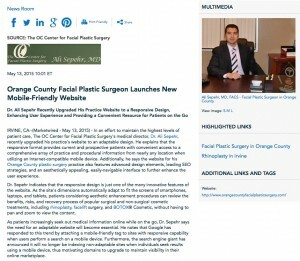 Irvine, CA—In an effort to maintain the highest levels of patient care, The OC Center for Facial Plastic Surgery’s medical director, Dr. Ali Sepehr, recently upgraded his practice’s website to an adaptable design. He explains that the responsive format provides current and prospective patients with convenient access to a comprehensive array of practice and procedural information from nearly any location when utilizing an Internet-compatible mobile device. Additionally, he says the website for his Orange County plastic surgery practice also features advanced design elements, leading SEO strategies, and an aesthetically appealing, easily-navigable interface to further enhance the user experience. Dr. Sepehr indicates that the responsive design is just one of the many innovative features of the website. As the site’s dimensions automatically adapt to fit the screens of smartphones, laptops, and tablets, patients considering aesthetic enhancement procedures can review the benefits, risks, and recovery process of popular surgical and non-surgical cosmetic treatments, including rhinoplasty, facelift surgery, and BOTOX® Cosmetic, without having to pan and zoom to view the content. As patients increasingly seek out medical information online while on the go, Dr. Sepehr says the need for an adaptable website will become essential. He notes that Google has responded to this trend by attaching a mobile-friendly tag to sites with responsive capability when users perform a search on a mobile device. Furthermore, the search engine giant has announced it will no longer be indexing non-adaptable sites when individuals seek results using a mobile device, thus motivating domains to upgrade to maintain visibility in their online marketplace. Ultimately, Dr. Sepehr endeavors to provide an exceptional patient experience both online and in the office, and he explains that upgrading to a responsive site is one way in which he follows through on this goal. Just as he believes completing continued education courses, utilizing the most advanced medical techniques, and adapting to the needs and goals of his patients are priorities, the Orange County plastic surgeon also emphasizes the importance of maintaining a state-of-the-art practice website. Led by Ali Sepehr, MD, The OC Center for Facial Plastic Surgery offers a comprehensive array of surgical and non-surgical facial and skin rejuvenation procedures for patients in the Irvine, Newport Beach, and Orange County area. Emphasizing leading techniques and technology and a compassionate environment, the practice also prioritizes natural-looking results and customized treatment plans that address the unique anatomic needs and aesthetic goals of each patient.